Dov Jacobson | Thu Aug 1st, 2013 12:09 p.m.
Material that has been brought to the XFR STN open-access media conservation project is now beginning to appear online at the Internet Archive, and there are some real treasures. 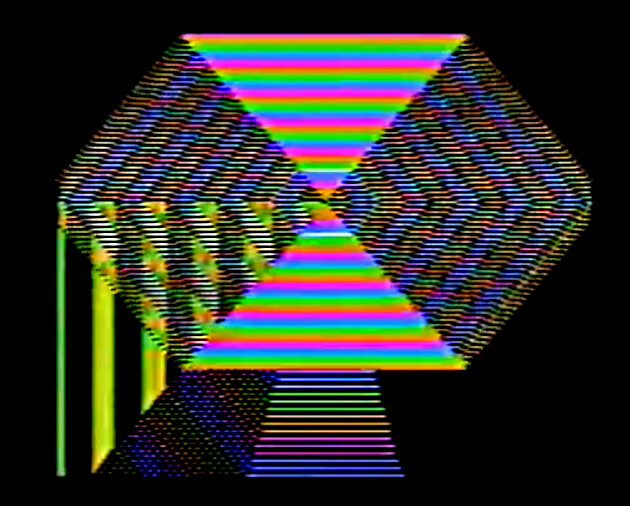 One of these is Human Vectors by Dov Jacobson, included on a 3/4" videotape brought to the XFR STN by Phil Sanders. The tape included a compilation of works itled EVTV2, originally shown at Sanders' art-and-technology focused East Village RYO Gallery in the early 1980s. The piece caught our eye because of its apparent use of a vector-based computer animation system (for more on vector graphics, see this recently published interview). Jacobson gave us some background on the piece via email. — Ed. 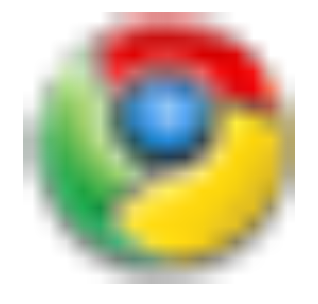 Michael Connor | Mon Aug 5th, 2013 11:05 a.m.
Screenshot of Google Chrome logo resized in Google Chrome. When we began working with Jesse Darling on her recent Performance GIFs series, she had a request: she wanted all of the GIFs to open full-screen in their own window, like this. In order to accommodate this, Rhizome's Senior Developer Scott Meisburger made a new full-screen GIF viewer app, GIFZoomer, which we open-sourced and made available on Rhizome's GitHub repository. Rhizome | Mon Aug 5th, 2013 5:01 p.m. Without further ado, here are more selected events, exhibitions, and deadlines this week, all culled from Rhizome Announce. The AND 2013 Fair in Liverpool, UK, inspired by the World's Fair of old, calls for submissions from artists, hackers, technologists, and makers all over the world. A £500 bursary will be offered to emerging practitioners to support their participation. Rhizome | Wed Aug 7th, 2013 10:52 a.m.
Frames from television program (1964) featuring a demo of Ivan Sutherland's Sketchpad, edited in Photoshop to show the onscreen graphics more clearly. Here at Rhizome, the big news of July 2013 was the launch of the open-access media conservation project XFR STN, a collaboration with the New Museum. We asked artists to Bring Us Your Obsolete Digital Media. Treasures are now beginning to emerge, and can be seen on the Internet Archive. The press is taking note. Prosthetic Knowledge assembled a much-Liked collection of works on dance and technology. Orit Gat explored the idea of The Book as Interface in her review of the new publication from or-bits.com, WYSIWYG. Michael Connor explored the emerging language of the website takeover in the most recent effort by Hannah Perry and Bubblebyte. Rafaël Rozendaal and Jürg Lehni appreciated the finer points of Vectors. 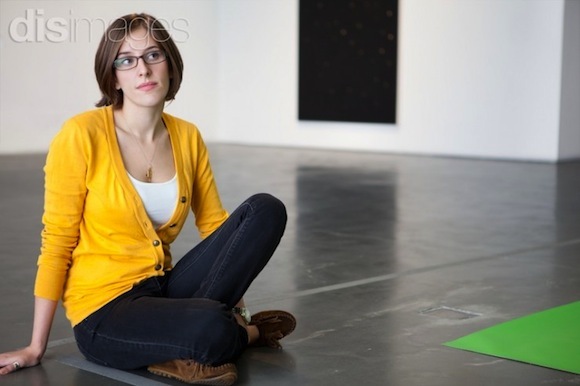 Daniel Rourke profiled artist Nick Briz about the politics of the glitch, Karen Archey interviewed Biennial of the Americas curator Carson Chan about post-internet curating, and Zoë Salditch interviewed 4Chan founder and creator of DrawQuest Chris Poole. Eva Díaz discussed the geodesic dome as a networked structure from Drop City to Rockaway Beach. 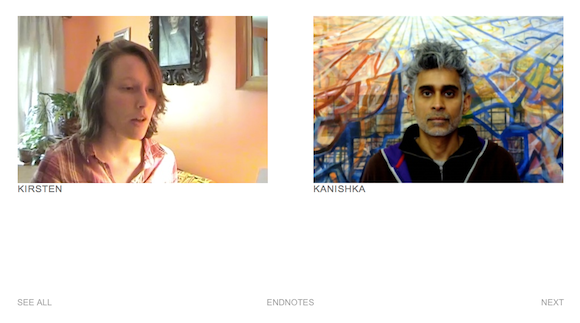 Rhizome | Wed Aug 7th, 2013 11:17 a.m.
Former interns have participated in Rhizome-commissioned projects such as DISimages. Rhizome is offering a range of professional development opportunities for the fall semester: an Editorial Fellowship, an ArtBase Curatorial Fellowship, and a Program Internship. Each of these individuals will join a small team and play a central role in shaping the organization and its core program as it deepens its collections and expands its program internationally. Michael Connor | Thu Aug 8th, 2013 12:20 p.m.
Summer (2013). Olia Lialina. 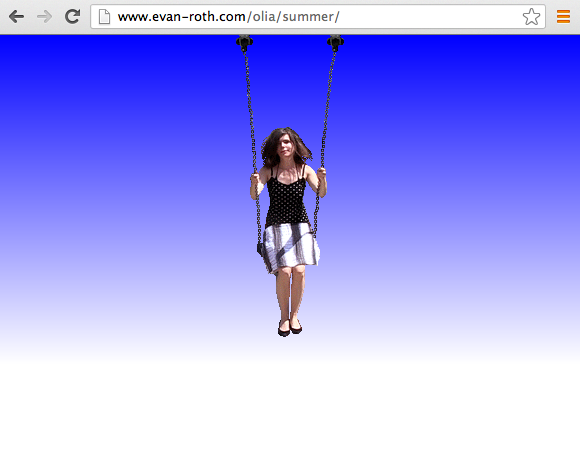 Screenshot of animation comprising individual GIF images displayed across multiple websites. In a 2006 interview with Valeska Buehrer, artist Olia Lialina observed that her early web-based works, particularly My Boyfriend Came Back from the War, have been irrevocably changed by the accelerating speed of the internet. Though the work is still as it was: same files, same address, links -- it is now more like a documentation of itself. Because everything else changed. First of all connection speed. I could now click through my work in one minute. Probably, I could do it even faster...if there is no delay in between phrases, no waiting for images, no Jpeg "progressive scan" loading -- the tenseness of the conversation is lost. 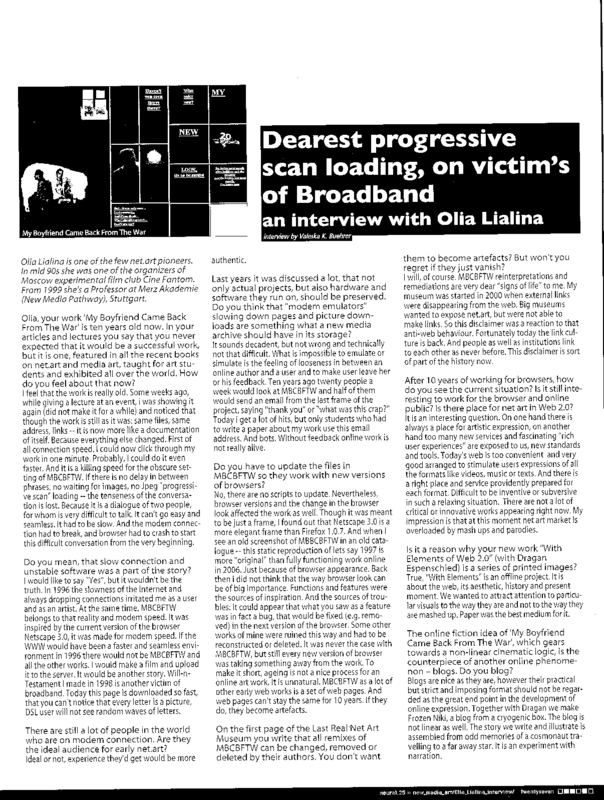 It wasn't that Lialina was inspired by the creative possibilities of the slow-to-load early web (she recalls being as frustrated as any user); it was that the work functioned within a specific technological context. As the context has changed, so has the experience of the work. Michael Connor | Thu Aug 8th, 2013 2:05 p.m. Artist Marc Ngui recently returned to his A Thousand Plateaus drawing project, in which he visually interpretats the famous text by Gilles Deleuze and Felix Guattari. Ngui had previously only illustrated the first two chapters, but he is now working his way through the rest of the book and uploading his work to a Tumblr. The above image is from the original series, created as an illustration of chapter 1, paragraph 6, which includes some rather key statements: "Any point of a rhi­zome can be connected to anything other, and must be;" and, "A rhizome ceaselessly establishes connections between semiotic chains, organizations of power, and circumstances relative to the arts, sci­ences, and social struggles." Gene Mchugh | Mon Aug 12th, 2013 11:57 a.m. Recently, Rhizome featured vector animations by Dov Jacobson that had surfaced at the XFR STN open-access media conservation project. Another standout work from the same videotape (RYO Gallery’s 1986 EVTV2 compilation) is the sensorially intense Sunflower Geranium (1983) by Don Slepian. Michael Connor | Mon Aug 12th, 2013 12:37 p.m. This week, New York is awash with sound art, led by MoMA's exhibition Soundings: A Contemporary Score (which features work by Rhizome-commissioned artist Tristan Perich). 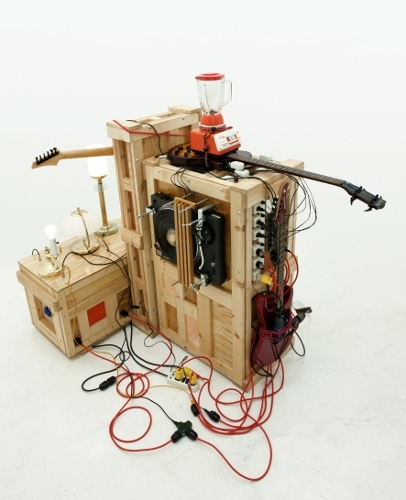 One event organized in conjunction with the MoMA exhibition looks particularly interesting: Jacob Kirkegaard's Labyrinthitis, in which the artist "sparks audible emissions within the audience's own ears" inside a "floating cube" at Eyebeam. The piece uses the listener's ear as an instrument, and it sounds like the best $11 night out we've heard of in a long time, except… it's sold out. More performances, please? In June, Mr. Kim-Cohen chided the survey at the Modern for including such work, which he described as the sonic equivalent of Op Art, a movement in painting “that does not demand (or merit) serious critical response,” as he has written. This summary doesn't do justice to Kim-Cohen's ideas, but for the record: Op Art absolutely demands serious critical response, as does sound art that you actually have to, you know, listen to. We take it as a good sign that the listing for Labyrinthitis includes a diagram of a cochlea. Prepare to put that organ to good use. So without further ado, here are more selected events, exhibitions, and deadlines for the near future, all culled from Rhizome Announce. Orit Gat | Tue Aug 13th, 2013 11:13 a.m.
Laylah Ali, John Brown Song! (2013). Cropped screenshot of website with Quicktime videos.